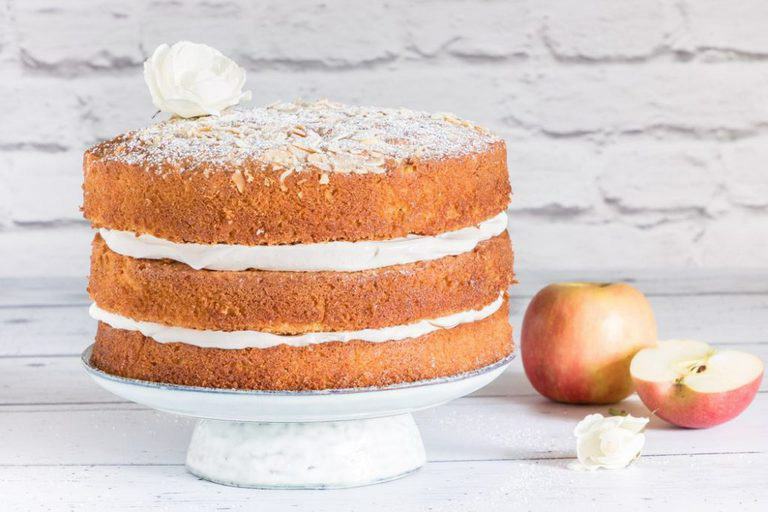 The stunning Almond Cardamom Apple Cake is super moist and full of warming autumnal flavours that make your kitchen smell delicious. 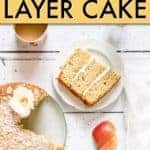 Make this Apple Layer Cake when apples are abundantly in season. Delighted to have teamed up with OXO to bring you this recipe. Although it is a sponsored partnership, all opinions are my own. The Great British Bake Off has landed off, which means CAKE. Not that I need any excuse to make this Almond Cardamom Apple Cake. Nope the fact that it is full of autumn flavours likes warming cardamom, citrusy orange zest and here there and every fall apples, plus yeah a little bit of cardamom in the whipped cream too means that I HAD to make it anyway. But the GBBO just helped me make this Apple Cake that little bit earlier that I would have. Because face it baking mania is here, and for the next few weeks we will be glued to our screens, watching the drama unfold, swept up in the enthusiasm, sharing the highs and the lows (from our safe sofas and kitchens), baking, testing, dreaming away, rooting and cheering like mad when our favourite contestant gets the result that we want. All the time wishing we were brave enough to have entered in the first place. Or is that last part just me? 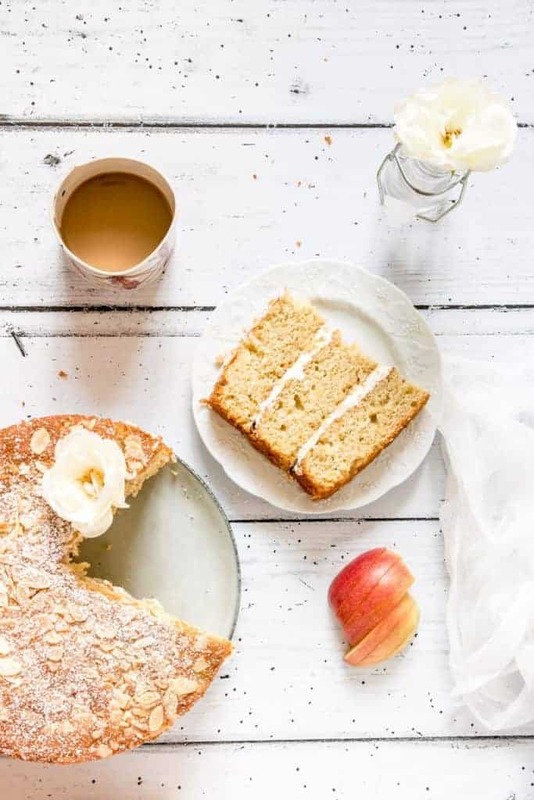 The secret to this perfect (in my not so very humble and definitely right opinion) almond cardamom apple layer cake is – yes you guessed it – the apple. But not just apple in the usual form. But apple cut into chunks then simmered with a little sugar and water till they fall apart in almost puree form with a few little chunks still remaining. That apple puree gives the cake such an awesome flavour especially lifted by the cardamom and orange peel powder. This could so be my Christmas cake (hello christmasy orange and cardamom) and Easter cake and my well, my everything cake. It can’t hurt to be prepared. Step 1. Simmer the apples along with the water and 50g of the caster sugar in a pan till the apples have almost turned into a puree. Set aside and let cool. Step 2. 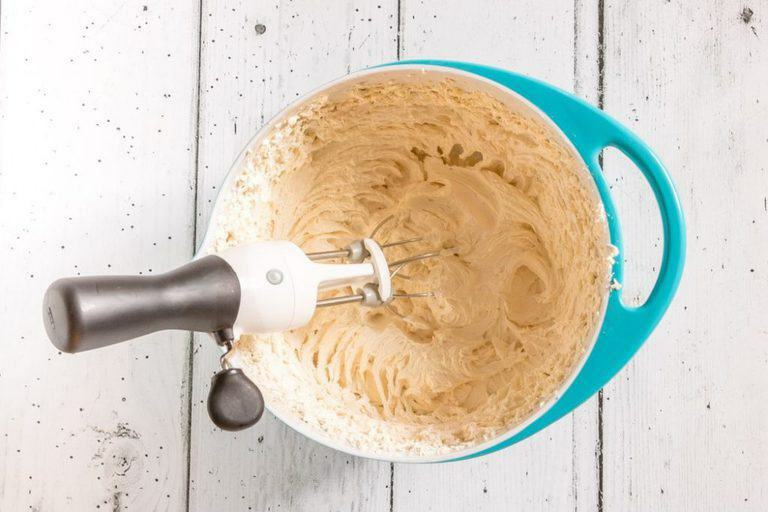 Add butter and remaining sugar in a bowl and cream with an electric handheld mixer until light and fluffy. Step 3. Beat in the eggs one at a time before beating in the almost pureed apple. Step 4. Mix together the flour, baking powder, salt, cardamom, and orange peel in a large bowl and then fold in the wet ingredients. Step 5. Divide the mix equally among 3 prepared cake tins, sprinkle the almonds on top of one of the cakes and bake in the hot oven till done. Step 6. Leave the cakes to cool in the tins for 10 mins, then cool completely on a cooling rack. Step 7. Make the whipped cream by mixing the cream, sugar and cardamom together whipping to soft peaks. Step 8. Spread half the whipped cream on the top of a plain topped cake, place the second plain topped cake on top and cover with the remaining whipped cream. Step 9. Then top with the almond covered cake, sprinkle on some icing sugar, slice and serve. Apple Cake batter about to go in. You can swap the spices to your taste. Cinnamon, for example, works really well in this cake. I used Braeburn apple for this, feel free to use other firm sweet apples to your preference. You can use pears instead of apples in your cake. For more cake recipes why not try out these below. Orange Bundt Cake Salted Caramel Whiskey Drizzle. Berry, Orange Blossom and Elderflower Cake stuffed with Mascarpone Whipped Cream. 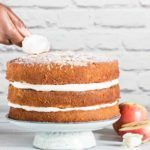 Thank you for reading my Almond Cardamom Apple Layer Cake recipe post. This post is sponsored by some really lovely folk. 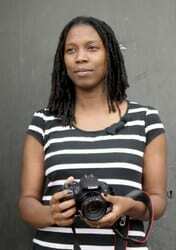 Thank you for supporting them, as they make it possible for me to continue dreaming up recipes, African recipes, Sierra Leonean recipes, travel plans and much more for you. Opinions as always, are my own. 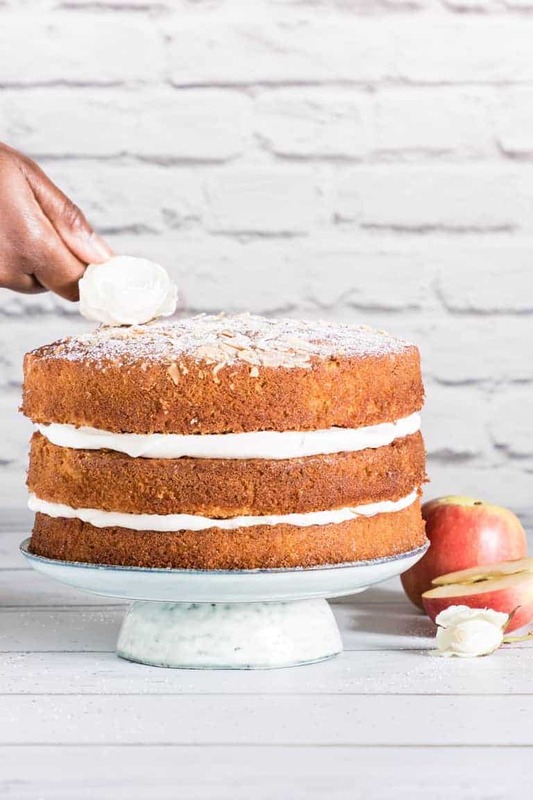 Don't forget to tag #recipesfromapantry on Instagram or Twitter if you try Almond Cardamom Apple Layer Cake! It is really, really awesome for me when you make one of my recipes and I'd love to see it. You can also share it on my Facebook page. Please pin this recipe to Pinterest too! Thank you for reading Recipes from a Pantry. Add the apples along with the water and 50g of the caster sugar in a pan over medium heat and cook for about 15 mins till the apples have almost turned into a puree. Set aside and let cool. Add butter and remaining sugar in a bowl, and cream with an electric handheld mixer until light and fluffy. Then beat in the eggs one at a time, making sure to beat the mixture well after each addition before beating in the almost pureed apple. Mix together the flour, baking powder, salt, cardamom, and orange peel in a large bowl and then fold in the wet ingredients. 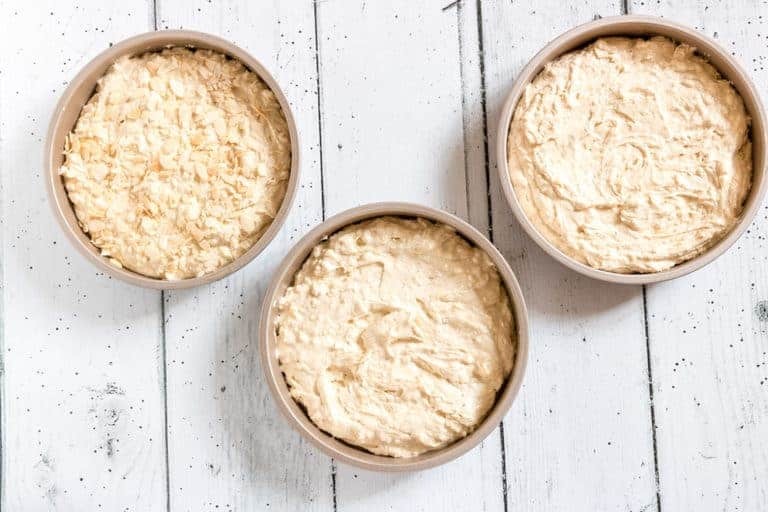 Divide the mix equally among the 3 prepared tins, sprinkle the almonds on top of one of the cakes and bake in the hot oven for 30 mins or until a skewer inserted into the cake comes out clean. Make the whipped cream by mixing the cream, sugar and cardamom together in a large bowl and whipping till the cream forms soft peaks. 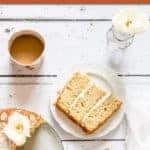 Spread half the whipped cream on the top of a plain topped cake, place the second plain topped cake on top and cover with the remaining whipped cream. Then top with the almond covered cake, sprinkle on some icing sugar, slice and serve. Can I please wax a little bit about the tins they were baked in? And for us keen bakers and secret GBBO wannabes we should be checking out the awesome OXO Good Grips non-stick pro baking range. First thing I love about this range is the weight of the items. They have got a good weight to them (in a very good way) which you know means a really good heat transfer for even cooking. This is such a yummy cake! Excellent recipe, Bintu! Yum! This looks incredible! And it looks easy enough that even I could make it! Aw I need to watch the GBBO this season! I haven’t yet done so. Thanks for the reminder, so I’ll be chilling on my couch now. 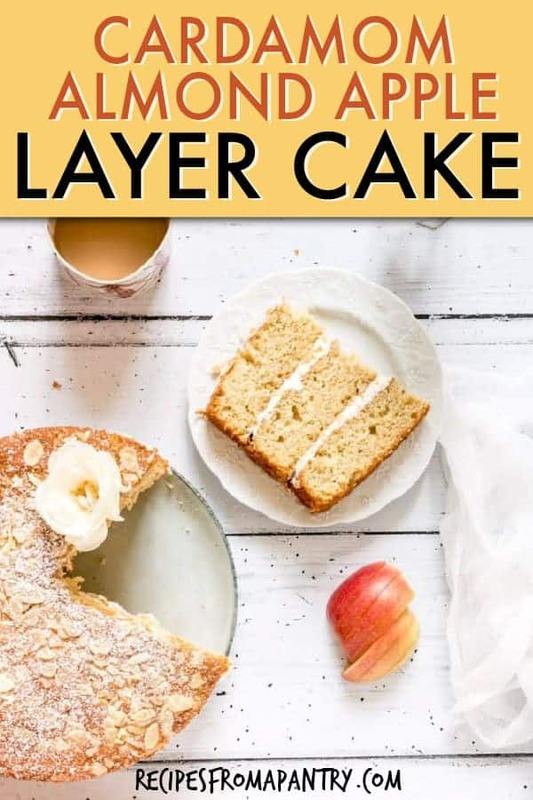 The cake looks delicious, and I like the idea of using apple puree! YUM!!! This cake is so gorge!!! What a gorgeous cake and three layers of it! Apple puree is such a smart idea. Those layers look perfect, I always struggle to get my sponges looking like that I need to invest in those good pans! Cake looks so delish! always loved your posts. I am loving GBBO already and this cake looks like an awesome way to celebrate its arrival! This cake looks worthy of the British Bake-Off–which is like my all time favorite show EVER! At first I thought you’d used apple sauce – but using apple chunks that are simmered with sugar till they are semi pureed is brilliant! That and the cardamom …mmmm… makes me swoon thinking of digging into a slice of this! This one looks very very nice – as is the prize. I’ve got to make this. What apples are best to use?